Colorforms Transformers 3D Deluxe Playset allows your BadassBoy to command Optimus Prime and the Autobots to save the Earth! 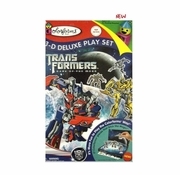 The Transformers 3-D Deluxe Colorforms Play Set features a 3-D play scene, four stand-up play pieces, and 17 Colorforms Stick-On pieces for play. Flip open the Colorforms 3-D Deluxe Play Set and join forces with Optimus Prime and the Autobots to save the planet Earth. Colorforms stimulate both creativity and imagination.